In this article, you'll learn how to work with email template settings after you've activated Email Marketing or Automated Workflow. From the Profile & Settings icon, select Settings. 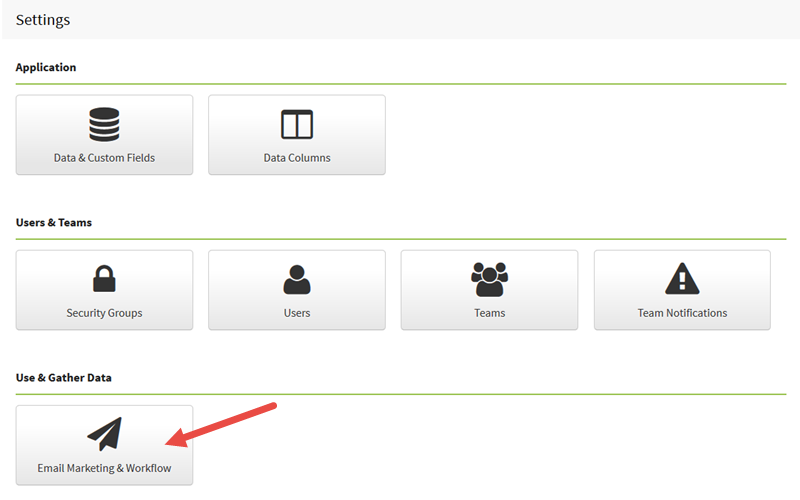 In the 'Use & Gather Data' section, select Email Marketing & Workflow. Select the email template tab. From here, update your business logo, email template colors, and footer text. Click the "Browse..." button to upload an image. Logos should be saved as PNG, GIF or JPG and work best when sized 200px - 300px wide. When creating & drafting emails, you then have the option of including your business logo in the header of the email. When selecting template colors for your emails, consistency is one of the most important things to keep in mind. The look and feel of your emails should coordinate with your website, marketing materials, and any other branded content. Don’t use hard-to-read colors like red or anything neon. Also, try to stick with 1-2 main colors, then use subtle colors for backgrounds and accents. Select the box and a color picker will display. Choose your color and select "OK"
Note: If you have a specific color, you can enter it using Red Green Blue (RGB) color values. If you have a Hex color code, you can look up the RGB of that hex color and then enter it. 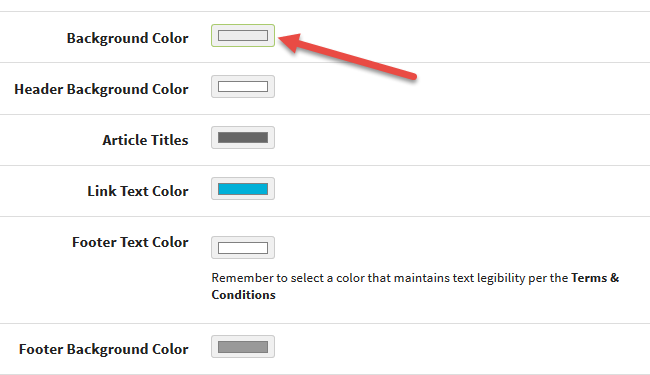 After you've selected a color, preview the change at the bottom of the page. Once you've finalized your selection, select Save to keep your changes. Due to browser limitations, in Internet Explorer, Edge, and most mobile browsers, you'll need to enter a value called a hex color code. A hex color code is a way of specifying a color by using a 6 digit code made up of letters and/or numbers. Hex color codes start with the pound sign (#). For example, #00B0D8. 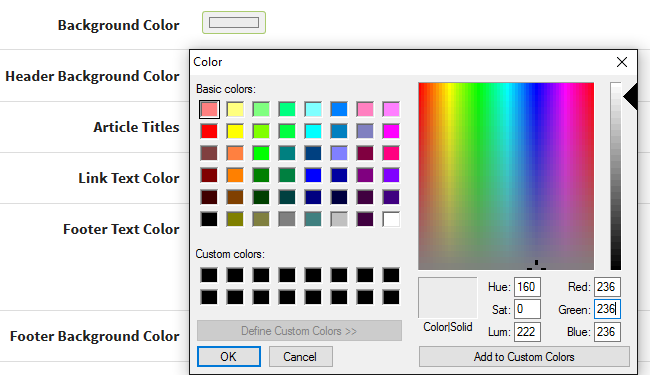 Color Hex Color Codes - Browse colors and find hex color codes. Coolors - Generate and explore color schemes. Here are the default email template colors in AgencyBloc. For your reference, included are the hex color codes and RGB values. When you have important financial disclosures or licensing information to include, you can enter that into the Footer Text box to be included on every email sent from Email Marketing and Automated Workflow. You can use simple HTML to format your text or insert a link. To insert a link, you'll need to insert HTML formatted like this: <a href="www.agencybloc.com">Visit Agenccybloc</a>. This will then create a link in your footer text. For additional examples on formatting text and working with basic HTML, check out this article on HTML Basics.